Note: For this Service type you do not use the standard codeREADr app. Instead, you will use the codeREADr KEY app. You can use either or both apps with the same app-user credentials. To see the difference between the apps, please see “Compare App Features” below. This type of barcode scanning is also known as a Scan Wedge App or a Keyboard Wedge App. We chose the name ‘Scan to Field’ because the scanning function is not an accessory ‘wedge’ but instead the app uses the built-in camera of the iOS or Android OS device. The codeREADr KEY app is a native app that works in the background allowing your authorized app-users to quickly and accurately scan barcode data into the form fields of native and web applications. It’s an enterprise-grade tool with sophisticated technology designed to increase your field worker’s productivity with fast data capture and error-reduction. Administrators configure the app in the cloud based on specific data capture requirements. For some tasks, more than one configuration is required. And, although configured in the cloud, it works both online and offline if activated at least once every 5 days. The codeREADr KEY Android app is available on Google Play and the codeREADr KEY iOS app is available on Apple’s App Store. Once installed your authorized app-users will sign into the app with the credentials you create for them on codeREADr.com. Then all they then have to do is tap ‘Scanner ON’ and the app will work in the background. You can have them use the default mode (a simple scan mode) or you can pre-configure the app for the appropriate scanning modes and smart scan filters. To use codeREADr KEY you must have a Paid Plan on codeREADr.com with SD PRO activated. You can upgrade and downgrade as needed. For volume pricing please contact bizdev@codereadr.com. To configure the app online before signing up for a paid plan, please email support@codereadr.com to request access. Or click here for instant demo credentials to just test the mobile app after downloading it. The app works in the background once active (Scanner ON). The app-user simply taps a targeted form field in the native or web application so the cursor is blinking in that field. The app-user can then activate the camera to scan. The experience is a little different between the Android and iOS apps. Please refer to these screenshots and instructions to see how each one works. 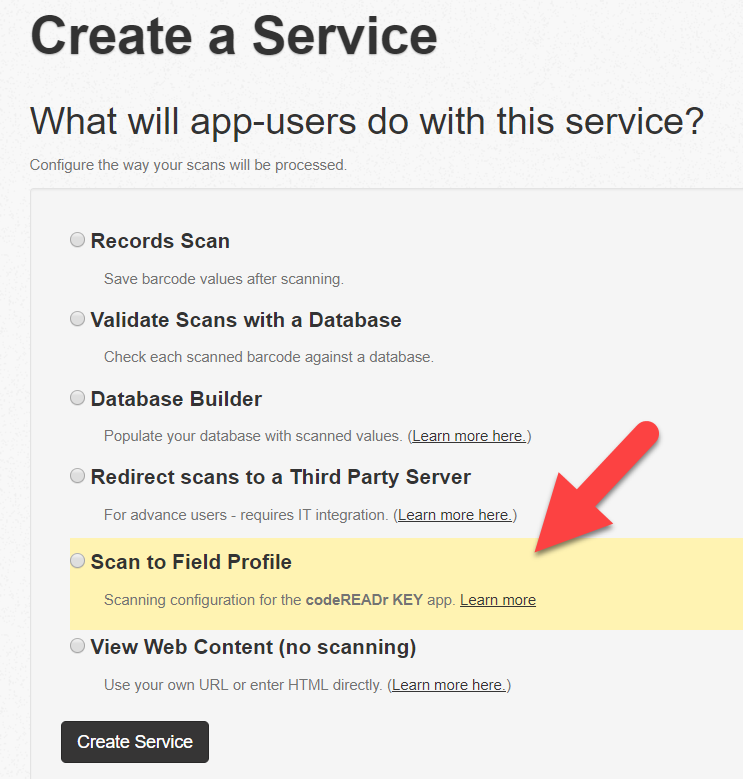 To configure the codeREADr KEY app you need to go to the Services page and select “Create a Service”. When this goes live (Dec 12, 2018) you will select the option “Scan to Field Profile”. Once you’ve selected that option you can configure codeREADr KEY with powerful modes and filters ideal for fast, accurate scanning. Barcode Scanning Modes and Smart Scan features. During this configuration process, you can create as many profiles as you want and assign one or more profile to each app-user on the Users step. Both the codeREADr and codeREADr KEY apps have the same barcode scanning technologies. The codeREADr KEY app lets your app-users scan barcode values into the form fields of your own website and apps as well as most third-party apps. However, with the codeREADr app, you can use codeREADr.com to easily configure mobile app workflows specific to the task at hand, including database validation, and you can also configure sophisticated data collection methods (photos, signatures, GPS location, etc.). Compare the codeREADr app to the codeREADr KEY app. If you have any suggestions for making the app better for your use case please share them by emailing support@codereadr.com.